Since a few months before the launch of All the Light There Was, I have been sending out a newsletter to friends, family, and interested readers. Below is my latest missive with instructions on how to sign up to receive the newsletter yourself. Well, I didn’t go to Book Expo America as planned. I was flattened by a virus and had to cancel pretty much everything for the week. I was sad to miss the event at the Republic of Armenia pavilion, and even sadder to miss a private dinner with Archipelago Books and translator Maureen Freely to celebrate the publication of Sait Fait’s A Useless Man: Selected Stories. While I was sick in bed, I read and loved the stories—the working class people, the scenes in and around Istanbul, and the humane, often melancholy, and yet sharp voice of the narrator. For the past two months I have been enjoying Skype calls and email exchanges with a young Palestinian writer and translator in Gaza as part of a mentorship program called We Are Not Numbers. Please read the first harvest of our collaboration: Enas Fares Ghannam’s piece, FORCED: A Story from Gaza. An article I wrote entitled “Choosing ‘Co-Resistance’ Rather Than ‘Turkish-Armenian Dialogue’” for the hard copy of Armenian Weekly’s April 2015 Armenian Genocide Magazine posted online last week. And for those who are following the upcoming Turkish elections, you might find this amusing: Erdogan accused journalists, gays and Armenians as being ‘representatives of sedition’ through supporting the opposition, Kurdish-friendly HDP party. In The Nation, Maria Margaronis offers a good overview of the issues at stake in this election, along with some paragraphs about Armenian Genocide Centennial commemorative events in Istanbul. 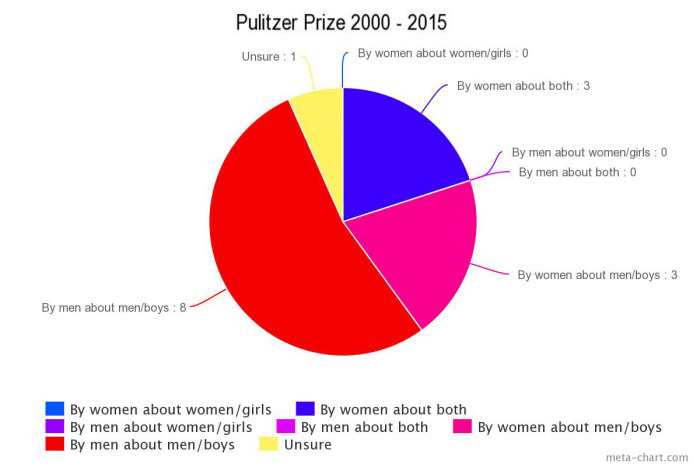 At the end of May a novelist named Nicola Griffith wrote an essay about the fact that books about women tend not to win big awards and a second piece on the topic that offered solutions. Nothing in the data Griffith collected was surprising (disheartening yes, surprising no), but the pie charts were great. The inimitable Ursula Le Guin also wrote an excellent piece entitled Up The Amazon about Amazon, books and capitalism that I highly recommend. Thanks, as always, for your support and interest. Please feel free to forward to a friend. Anyone can sign up to receive this newsletter by sending a note to nkbookgroup@gmail.com.